The amount of coincidences and right place, right time moments in this movie is absurd. I’m trying my best not to completely ruin it for you, but the climax takes part in Chernobyl where just about everyone but John McClain and his son are walking around in biohazard suits. Apparently the 007 of Plainfield New Jersey and his offspring are immune to radiation. I hope in the next Die Hard film, John McClane grows an extra finger and has to save his son from the gigantic tumor in his brain. 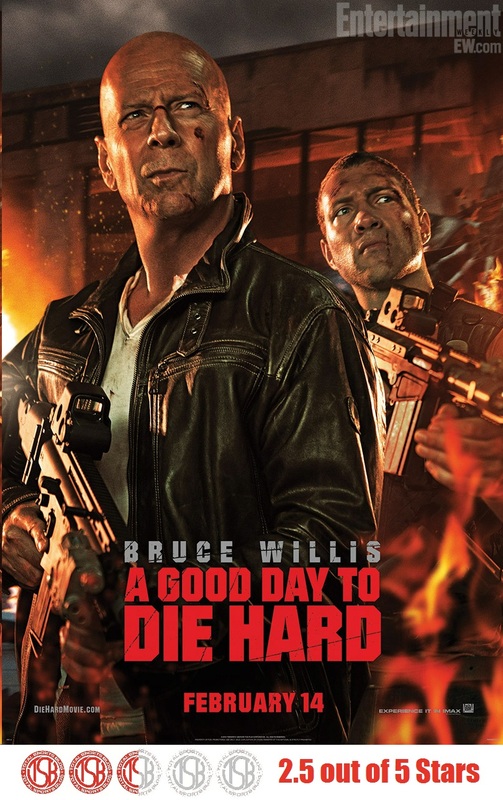 At least it would show some sort of continuity and consequence for their actions in A Good Day to Die Hard. I have to admit that even with all the WTF moments, I left the movie satisfied. If you go into the theater with the mindset that you want to see things explode and not a cinematic masterpiece, you won’t be too disappointed. 2.5 Stars… and I’m probably being a bit generous. Awesome review. This film almost felt “forced” and it felt like there was not much thought put into it, especially the script. McClane is known for his famous one-liners but this film just goes over the top with them and repeats old ones. thanks for reading Dan O. I was about 7 or 8 beers deep when I saw it. I agree the script was terrible. This should be the movie to kill the franchise, but it won’t be.